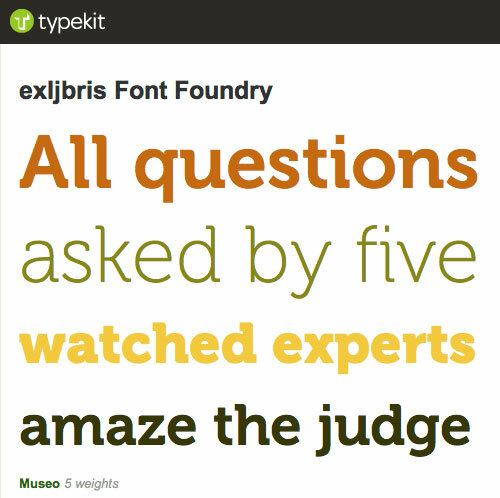 exljbris Font Foundry now on Typekit with Museo, Museo Sans and Calluna. You can expect the rest of the typefaces next week. Would love to say yes, but I still have to look into that. I recently tried Typekit, because it offers Calluna and Museo that I wanted to use on my website (and on the websites of our clients). Unfortunately, there is no support for non-Latin characters (even though the fonts themselves have them). Is there another way to use these fonts on the web? You could try Cufón. It’s now allowed for all my fonts. I really hope Typekit will offer extended laguage support soon. And if I use one of the free versions directly on the web? Is it allowed? I just wanted to express my appreciation for your policy on web typography. I hope more type designers/foundries follow your lead. That’s very kind of you, Dave. Thanks. Absolutely fantastic. I am using Calluna on my website via this service, and the rendering seems better than when I use the Calluna installed on my computer. Is this deliberate or my imagination? Could this improved version replace the one downloadable from MyFonts etc? It is a TTF version done by Typekit with a limited character set. It can only be used via the Typekit service. I just implemented Museo on my web site through the Typekit service and even posted a blog post on it. Keep up the great work, when I have a few more pennies I will be investing in the whole family. Any plans for Fontin Sans to appear on Typekit in the future? No plans for that, because @font-face is already allowed for those fonts. I just started using Museo Slab and Calluna on my blog. They’re lovely. I’ve been using Museo for small, internal print projects, and I feel lucky to be able to. Thank you for having such a benevolent policy.